Last minute as usual... Dawn's challenge this week was to create a New Year's card. Always seem to do mine last minute but that's me: I'm a last minute, cram everything in, kinda gal ! 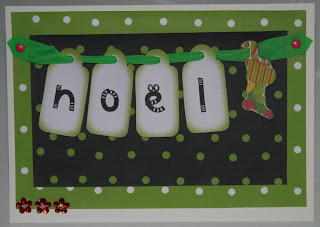 Backing paper is from Funky Fairy Colourful Xmas Daze. The expo & demo for the Téléthon (research into genetic disease) went really well. The school bought classes of children round on Friday afternoon so I had to explain techniques in French and got a round of applause from one class! I had 2 brilliant French women helping me on Saturday who were able to chat to people about things and do the sales while I did the making. Had loads of pics taken as well so likely to be in the local paper but this is one my husband took while I was setting up. At first it felt scary to fill a whole room and then I was struggling to find space. Sold about 130 cards plus other bits and pieces: I gave the Téléthon over the 25% of takings agreed and the organiser said it was the most an expo had ever contributed. 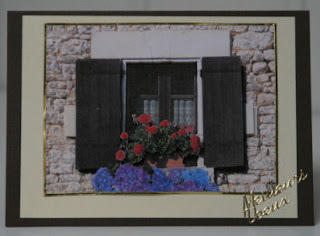 The cards of local scenes (below) sold very quickly. I have 26 more orders and people asking if they can pop round to buy. Our village made 12,689€ all together and I shall be going to the cheque presentation on Saturday night. Very pleased about all that but got LOADS of jobs to catch up on, including all my Christmas shopping. Over in the UK for a few days visiting family and friends just after Christmas. Looking forward to that but it will also be exhausting as they are spread across the country. 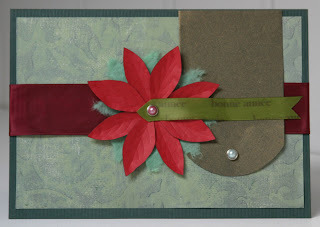 Happy to say Dawn has made life a bit easier: This week's challenge is to make a New Year's card. As long as that can be in French, it won't be hard to do as that is what most French send cards for: Far less demand for Christmas cards. Hopefully I shall catch up with myself sometime in February! It is very late on Sunday night so apologies that I'm not going to make this week's challenge. It was a good one too: To make a Valentine's but the card must not contain the colours red or pink, can use any text but not the word Love, use any image but not hearts or flowers and finally no rude ones ! 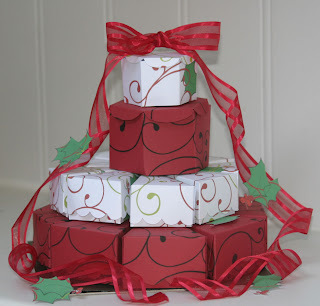 This 20 piece set of boxes was based on templates in the Craft Robo Crafty Club by Sharon Long. I printed 2 different designs from Funky Fairy Papercrafts 'Merry Christmas' collection, one on to red card and one on to white, and used the CR to cut. Having said that the red card is 260g so the robo just scored in to it and I used scissors to free the shapes. I also removed all the dashed lines and scored creases by hand and created the top red box by taking apart and altering the small one (resized it and created a separate lid). 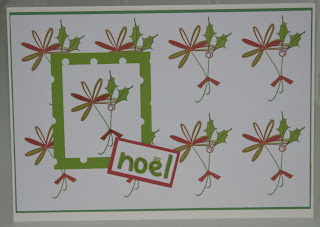 After gluing all the boxes and lids, I finally added ribbon and holly pieces cut from spare pieces of the printed card. Might get round to adding a third larger tier but I think there's enough there for now! After Meayla set the Monday challenge of a B&W Xmas card the team got busy and that made it harder to come up with something different. However, yesterday morning I woke up with a design in my head of an acetate card with this tree floating in a circle of snowflakes... and this is nothing like it! Well, it sort of is: The Funky Fairy Merry Xmas design is printed on acetate and the tree (cut on craft robo from a design by Ikmabram on UK scrappers) is as I imagined it but I have added the white card inside and, after cutting my thumb badly yesterday, the snowflakes were too fiddly so this is a simpler version! I feel soooo frustrated as it is my right thumb I've cut and I'm really busy but guess it will be back to usable in a day or two. I absolutely love the B&W designs in the Merry Xmas set: They look beautiful on different colour card and are cheap to print too! This may seem odd if you are not local to Finistére but these cards are so popular that I am waiting for 50 sheets (for 100 cards) to arrive from the printers! I have lots of advance orders and will sell the rest at the Expo I am doing Friday & Sat next week in St Yvi. They are each pyramid decoupage of St Yvi, Locmaria and the Ville Clos at Concarneau. 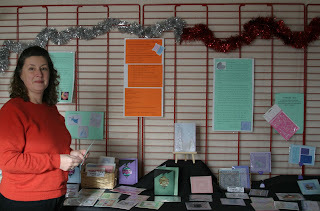 All my designs: I took the photos, created the pyramid decoupage and the cards. Fellow CT member Louise made a great card with mitts (shown as project on FF site) so I decided to do a French version and, after hubby said my mitts look like boxing gloves (! ), I made a hat version too. Also a snowman for good measure. 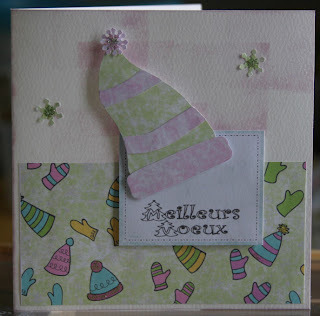 All papers are from the Colourful Xmas Daze collection. 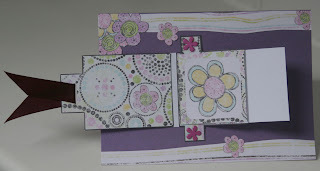 Square card blanks, snowflake punch and lilac ink pad are all docrafts. Andrea set a recipe for this week's challenge of 2 backing papers, 3 flowers, 2 brads, 1 piece of ribbon, 1 motif & 1 word so I threw those in a bowl, gave it a good stir with a dash of holographic glitter glue to hold the flowers, and this was the result: Nothing like the original idea I had but I like it! All the papers, tags & the stocking are from the Funky Fairy Merry Christmas collection, which I love. Haven't even got started on some of my favourite designs yet so there will definitely be more to come. This last card looks really flat in the photo but is actually 3D and has holographic powder embossed on the top image and over the letters. 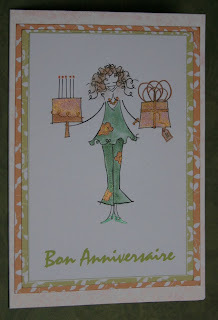 Green & white card from The Papermill Shop (from whom I took a rather large delivery while in UK last weekend!) and brads, flower gems, embossing powder and holographic glue are all docrafts. Ribbon from my stash. I know that might appear like I'm sucking up to teacher but I had to make a decision and I love that card. 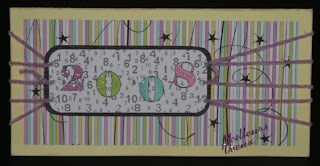 Lotty on docrafts forum also made a card with an undies and Ooh La La theme which I also love. Honestly think they were all great entries however Sharron gets awarded with the tag she designed herself: Well done Sharron. 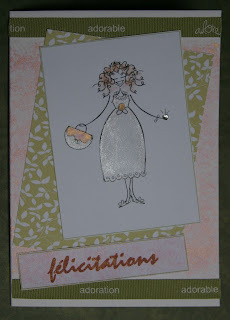 I have used some Pink Petticoat 'Lilli' images with PP papers to make a couple of French cards. The background sparkle is from some 'luminescent' paint by Stamperia in Rose Gold with H2Os used for colouring the images. Also used some of the 10 (yes 10) spools of Heidi Swapp ribbon that have just arrived. 3 different ones, all in French and bought from USA! It is the red "C'est la vie" ribbon that I really love but will save that for another day when I can bear to cut it. So, come on the rest of you, let's see those French cards. 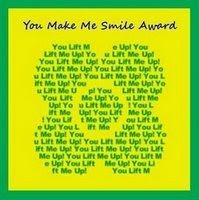 Sharron has created a great tag for the winner so I can't wait to award it (mine not included of course). I have been really enjoying looking at other blogs lately. I am finding it hard to keep up feeling truly creative whilst being on a Xmas card production line. Half-term followed by a 5-day migraine didn't help! I am also setting up a crafty business here in France and it is sooooo different to UK: Just spent 3 days writing a business plan and most of that time was translating the questions! Unfortunately I have to wait until February for the 5-day compulsory course before I can go 'official'. Exciting as well though. Anyway, talking of France, I decided that would be the challenge: To make a card with something French on it: It can be a French word or phrase or an image that is typically French. I don't think it is as hard as that might seem once you get thinking :D Please join in cos I can't wait to see what people do. Please leave a link to your blog or gallery so I can have a look and I will award some kind of cyber-prize (yet to be thought up) next Monday. I am in UK and away from PC Weds to Sunday for the wedding so if you post and don't get a response from me, I will look at them all next Monday. Will also get a card made sometime today in amongst the orders. 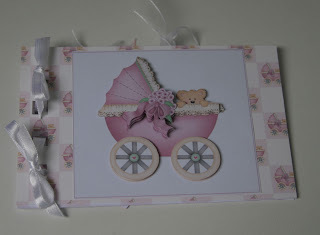 Monday's challenge from Natalie was to create a card with a teddy bear on. 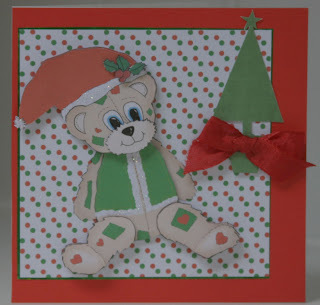 So, here is my first Rags card: Seriously cute decoupage bear created by Funky Fairy Sharron. I have been wanting to use this image (Rags 7) for a while so it was all the excuse I needed. 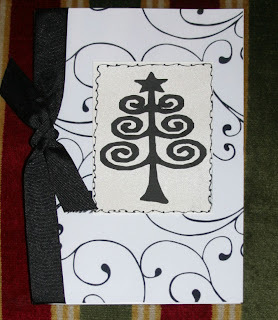 The tree and spotty paper are also Funky Fairy and they are mounted on some holographic green paper and red card on a craft tonic square card. Holographic glitter glue is currently welded to my hand so you might spot a bit of that too! I'll be setting a new challenge on Monday ... Watch this space! As I've made over 100 Christmas/New Year/Winter cards now, I thought I'd give a viewing of some of them. Many designs and most materials derived from docrafts, Making Cards, Craft Creations, Lakeland and my own designs with Funky Fairy materials. Some are already sold; most of the rest, and many more, will go on sale at St Yvi to raise money for medical research (Telethon). Food Challenge - Cupcake ! It's all been a bit of a rush as I have had my sister and Bro-in-law to stay for a few days but Louise set a challenge to make a card with an item of food as the focal point so I have used this Pink Petticoat cupcake image as mine. I decoupaged a slightly over-sized cupcake over the original and coloured it with gel pens, 3D pearly paints and a Papermania pearly pink adhesive stone. The backing paper is also a pearly pink although the flash has made it red in places. 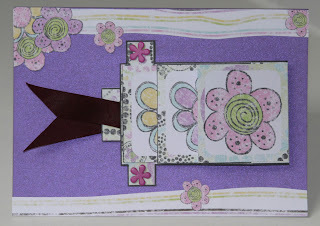 Papermania purple card with my hand-drawn edging and ribbons from my stash. Just finished the wedding card for my husband's son & DIL-to-be. They get married in Mauritius on Friday: Good luck and much love to you both. We'll be over to the UK for the reception mid-Nov which is an excuse for stocking up on stash for me. The scene and text were cut with the craft robo: The framed scene using a template by Linda (aka Gentleflower) on UK scrappers. Thanks again Linda! I've been tagged. My first thought was what kind of blogging madness is this but then realised it is a nice way of making connections and finding out more about people and also I get to show this smiley award: Thanks Louise! 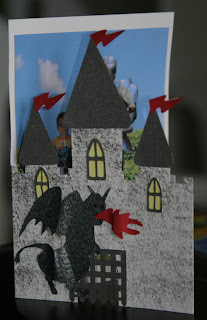 1: If you could have £100 worth of scrapbook paper or assorted embellishments, which would you choose? Embellishments! 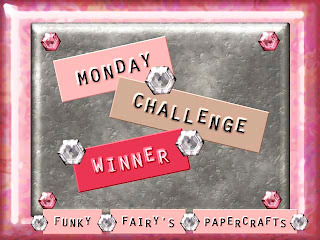 I can print or design papers but I like hording the bright and shiny embellishments. 2. If you had to choose between using only stamps or rubons, which would you choose? Had bad experiences with rub-ons and think stamps are much more versatile so it has to be those. 3. 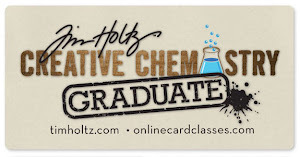 If you knew how to do both awesome cards and layouts but could only do one for a whole year...which would you do? 4. Would you rather own a scrapbooking store or have your own scrapping room at home? A store, then buying all the stash would be business expenses and home might be a little tidier ! 5. 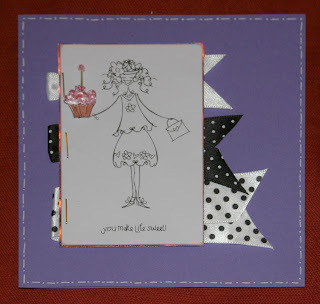 And last but not least, what is your CURRENT cardmaking or scrapping style? Using ribbons more at the moment, not sure why. Trying to stop hoarding embellishments and use them more. Generally quite a modern look I think. 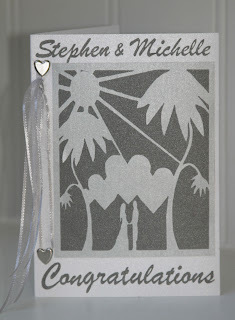 A waterfall card from the Colourful Daze collection with papermania brads; just pull the ribbon! From the Colourful Xmas Daze, a snowflake paper printed straight on to a Craft Tonic card with topper and printed acetate wrap for extra shine. Bouquet of Colourful Daze flowers and paper 'stems' with florists cellophane and Birthday kit text as a tag. Some flowers decoupaged and/or crystal glazed. 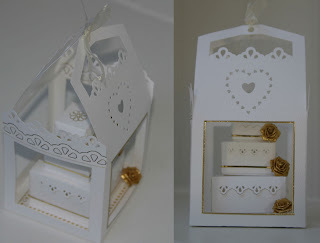 Just for the sheer fun of it I made up the fab boxed wedding cake from the craft robo template UK scrapper Jenniebean created and chose to decorate it with white and gold. 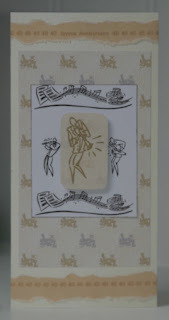 Needed a Clarinetist for this Jazz-loving 40th birthday card and found one on the Town sketches bandstand dingbat which I used to create my own paper and topper for this card. Finally, more Funky Fairy: Made an accordian card to play with the lovely Classic Xmas kit toppers and papers and used the same kit to cut a little box with poinsetta on the robo and finished with a tag. I'm a Funky Fairy ! Well, a member of the Funky Fairy Papercrafts Creative Design Team. Thanks Sharron. And well done to fellow team mates Tracy, Andrea, Louise, Joanne and Natalie. 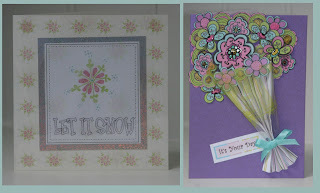 Here are a few pics of things I have designed using Funky Fairy's great downloads. 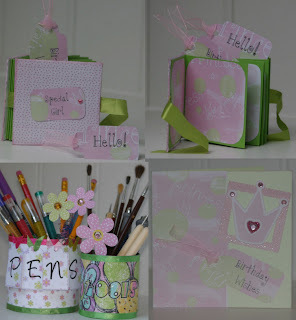 Mini-book and card using Princess Chloe papers and tags with Papermania card and ribbons from my stash. Pen and tool pots which now brighten my desk using 'Colourful daze' with Anita's sticky ribbon & craft planet glitter glue. 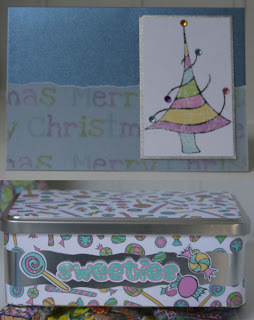 Card and sweeties tin using 'Colourful Xmas Daze' and more glitter glue. Just taken part in my first French meeting without anyone to tell me what was going on and translate for me. I must be improving! It was a village meeting to start organising our part towards this year's Telethon appeal (similar to UK's Children in Need). Bit nerve-racking when part way through I had to interrupt to make my suggestion...An exposition, with demonstration, of different card-making techniques and cards on sale with part-takings going to the appeal. I showed a selection of examples and they loved them! With that agreed, I'll have to get busy now! It's two afternoons the first week in December. And with all the Christmas cards to do: Glutton for punishment. And how in our history of language did we muddle the words so that in French exhibition is to expose yourself while exposition is to exhibit something? Finding it very hard not to embarass myself!